Carrick's Ross Irwin (40) made his short circuit debut in the Supertwins class at Kirkistown on Saturday. Picture: Derek Wilson. Birthday boy Ross Irwin became the fourth brother in his famous racing family to wind up the throttle as he made his short circuit debut at Saturday’s Ulster Superbike meeting at Kirkistown in County Down. The 30-year-old is a latecomer compared to his brothers Glenn and Andrew, who both compete for Paul Bird’s PBM Be Wiser British Superbike team, while Graeme is a top-level motocross rider and the reigning British MX1 champion. 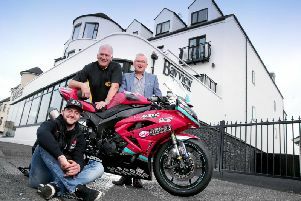 Ross – the oldest of the racing siblings from Carrickfergus – made a competent debut at the short circuit meeting on the Ards Peninsula on Saturday, where he twice finished in fourth place in the Supertwins races riding a Kawasaki. A former motocross rider himself, Ross opted to try his hand at the tarmac discipline of the sport after being encouraged by his brothers and his father Alan – who was a leading short circuit and road racer in his day.